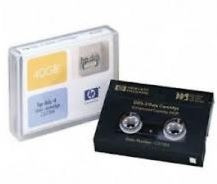 This HP C5718A DDS-4 tape cartridge, like all other HP DDS products, is tested beyond the industry standard benchmark which qualifies a product to bear the DDS logo. This means that where most DDS tape cartridges give you a maximum of a 1000 passes before becoming depleted, the HP C5718A will allow you to make 2000 passes and a minimum of 100 full backups. HP products (such as the C5718A) are also tested for full compatibility so that this C5718A cartridge is the optimum choice for your HP DDS-4 or DAT tape drive. The C5718A has a storage capacity of 20GB native and 40 GB compressed although actual storage capacity depends on your hardware and softwares compression ratio.